Resin Jewelry Tools Needed To Make Resin Fashion Jewelry. Basic resin jewelry tools required for making simple resin fashion jewelry items. As outlined on the resin finishing page when only a small amount of drilling and finishing is needed then the process is very straight forward. However it advisable to have a basic tool kit containing the following items for working with jewelry findings and resin jewelry. JEWELRY PLIERS such as chain nose, round nose and flat nose are ideal for jewelry wire work, bent nose and long round nose also come in handy. Round Nose - As the name suggests; the jaws taper to a small round point. Used in jewelry making to form loops, hold small components, close jump rings etc. The round nose will be the most useful set of pliers you purchase for resin jewelry making. These pliers are ideal for a wide range of jewelry making techniques..
Used for forming and bending many wire components. Flat Nose – Wire or sheet can be bent at angles, and to close jump rings. Flat smooth jaws hold pieces without marring. A good gripping tool, useful for bending light gauge metal. Bent Nose – Just like chain nose pliers, but with a bent tip. Ideal for reaching into narrow areas. Long Round Nose - This style of pliers is useful for forming large loops or for making jewelry clasps..
As you will use all or some of these pliers frequently for resin jewelry making you should purchase the best you can afford. Cushion grip pliers are the choice of many jewelry makers. Side-Cutters – Light weight side cutters are for cutting wire and beading cord. Use heavy duty cutters for large wire gauges. Examples of jewelry wire work can be found on our wireworks page. The above tools should be enough for normal resin jewelry making. If you wish to combine resin and metal in your jewelry creations then a range of metal work tools will be needed. 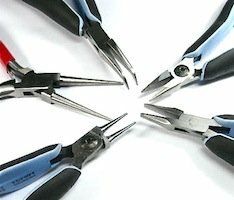 Tools you may consider are metal snips, scriber, center punch, flex tool motor or variable speed hand tool , burnisher and metal files, bench pin, bench vice. An online search of jewelers supply stores will show you the wide range of tools available.